With this priority in mind, it’s interesting to see how we approach home loans differently than other mortgage companies. We’re not your average mortgage company—we walk the talk every day. In fact, as a company, we’re debt-free! It’s important to us that each of our customers is not viewed as an online transaction, but as a real person who deserves great customer service and personalized attention. One of our main goals is to make sure each customer gets a loan that they love, one that isn’t a burden or that you’ll regret. There’s some alarming statistics about home loans out there! 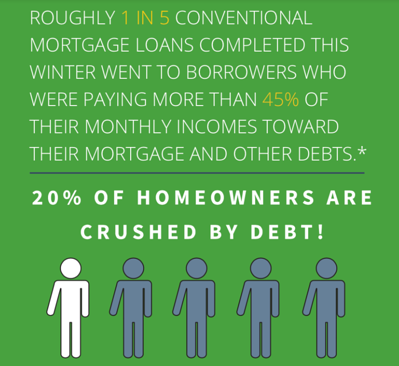 According to The Wall Street Journal, new research from mortgage data tracker CoreLogic found that about one in five conventional mortgage loans completed this past winter went to borrowers who were paying more than 45% of their monthly incomes toward their mortgage and other debts. "There are some cities where that may be a little more normal than others, but that feels like a whole lot of money. In general, if you’re spending almost half of your monthly income toward debt, that’s stressful just thinking about it. I wouldn’t recommend it,” explained Bob. Bob has his own approach to budgeting. We asked him how he would advise new homebuyers to budget for a monthly payment. At Churchill, we’ve found that debt-free homeownership is a popular goal for many of our customers and usually recommend our customers to stick around not spending more than 25% of their take-home pay on their home expenses. It’s a goal we feel is truly attainable and one that we encourage. Our Home Loan Specialists do their best to assist in the journey toward being completely debt-free. As you’re shopping around for a new home, make sure you find a mortgage company that makes you a priority, can meet with you in person or on the phone when you need to, and understands your future goals to save money and build wealth. For more information on how Churchill’s simple mortgage plan can save you thousands, contact us today! Bob Lotich started SeedTime (formerly ChristianPF) in 2007 with a passion to help fellow believers learn how to manage their money wisely. His personal mission (and the mission of SeedTime) is to make, save, grow, and give money to benefit others. After all, life isn’t about the accumulation of things, but is about how we can make the world a better place by giving. After making a full-time living from his blog, Bob realized that he could (and wanted to) help others do the same thing! So, from that passion came EfficientBlogging.com, which helps bloggers and wanna-be-bloggers build and grow their blogs! When Bob isn’t working, he is likely hanging with his wife Linda and their kids, Alden and Valerie, working on his garden, eating some 85% dark chocolate, playing guitar, or riding his motorcycle. Sometimes all at the same time.